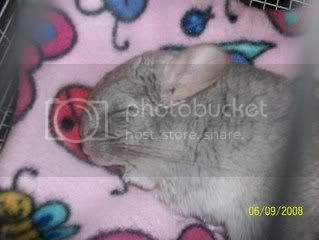 their poo, is constantly fleeing the cage along with everything else, i have had chinchillas for years and this has never been a problem, there is pee ruining the carpet and my mom is getting pi**** off what should i do? its a two story three teir cage and i dont want to go any smaller, but i will get a new cage, or is there a way i can adapt the cage? a picture of the cage and set up would help a lot. whats a poo cover, and the fleece things you are talking about? this is the best i can do for a picture, but thats the cage! That is the cage I have for my chins. I got deeper metal trays made to keep everything in. The poo still flies out on occasion, but I don't have any pee coming from the cage. The trays are about an inch and a half deep. are they for the ledges too? shelves (work well as poo guards) I got them from SIMPLY CHINTASTIC! the cover is Mansion Cage Cover then I use fleecy blankets to line it so they don't eat the cover. I did not order them through a company because my grandpa knows someone who did metal working so I didn't have to find a company, but before I realized that I searched for some and Bass Equipment was one I recognize. Heres what I did to my cage. Redid everything with Pine wood and make little poop guards around the edges to keep it from flying around. I also used plexiglass on the bottom for their pee area. They LOVE IT! Then on page 4 and 5 you will find the new cage setup If you click on the picture it will make it larger. I have also modified it a bit. Adding a flying saucer wheel (highly reccomend this!) and making the pee area half the sixe of the bottom shelf. Hope this helps! It cost a bit of money to do, but wasnt too tough. And TOTALLY worth it. Last edited by nik8806; 05-13-2010 at 11:47 AM. where do you have the guard set.. its hard for me to tell, unless they are onthe bottom, but i just thought they were the metal pans from bass.. I learned to use fleece fabric in the cage..... it makes for easy clean up - just take out side and shake. Hi am wondering if anyone has a recommendation for a good (and preferably attractive looking) chin cage. 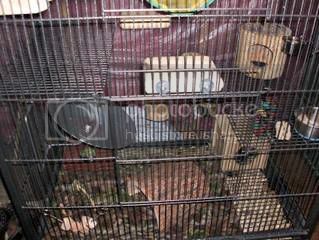 I have 2 males, father and son and at present they are in a standard metal cage from Pets at Home. Soon after getting them the father started to bite the babys whiskers and fur around his eyes which causes him to have white mucus in eyes and they sometimes stick together. I have since separated them in the cage with a purpose build separator with door. When his eyes are fine I let them play together as they love to be with each other and snuggle up to sleep, but if they look like have been bitten or may get sore I separate them again. My problem is that they then only have half the space they should have (even though they come out to play every day) and I want a larger cage that can be separated occasionally. I am struggling to find one in the UK that does not have plastic. My chins are chewers and no way could I put plastic in their surroundings. Also some cages such as the Liberta Happy House has unsafe ladders that they can catch their feet in. Can anyone help or direct me to a suitable retailer?